The buildings are located on two erven, which are registered under one title deed and include 1 870 secure basement parking bays. The buildings are situated in a prime location with the two even separated by Johannes Ramokhoase (formerly Proes) Street and linked by an enclosed air bridge. 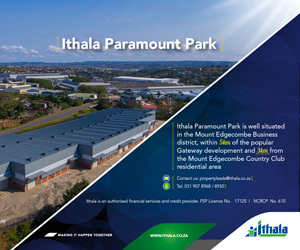 The sale of the properties - all of which are tenanted by Telkom under one head-lease and comprise a total gross lettable area (GLA) of 115 490sqm - is being conducted through Broll Auctions and Sales, with a closing date for offers set for noon on 30 June 2015. Marc Saks, Broll Auctions and Sales investment analyst, adds: “This is an exceptional opportunity for an investor to make a significant acquisition with substantial potential in the centre of South Africa’s capital city - home of the seat of central government administration. Saks further adds that demand for space, letting activity and market rents in the Pretoria CBD has remained relatively stable over the past couple of years. The Pretoria CBD has enjoyed huge demand for both vacant and tenanted buildings as it is still deemed the capital of government enterprise. The value for these sought-after assets continues to increase year on year due to the disparity between new-build costs and existing buildings. Telkom are on a fully insuring and repairing triple-net lease and are therefore responsible for all the expenses associated with the property until the lease expires on 31 January 2019. They are set to vacate seven of the buildings by August of this year (2015) as they complete their move to their new Centurion campus headquarters. Telkom will continue to occupy three buildings. Two of these buildings house IT and infrastructure equipment and will be occupied for a further two to three years, and a critical data centre known as the ‘PPR’ building will be retained for occupation indefinitely. Telkom will be responsible for all their obligations under the lease regardless of their occupation status. The buildings range in size with the three largest comprising 38 707sqm, 26 981sqm and 14 722sqm, with the balance ranging from 8 985sqm to the smallest building, Hilda Mansions, which comprises 1 021sqm. One of the buildings, the 4 358sqm Somerset House, is a National Heritage building, which places restrictions on possible alterations or renovations, while the façade of Hilda Mansions has historical status, which limits external alterations. After the closing date for offers, a due diligence period will follow for the successful purchaser/s.